We make muffins nearly every week at our house. The kids grab them on their way out the door for an easy "eat in the car" breakfast, and so I'm always looking for new recipes to try. I like to find varieties that incorporate fruit, and this one was perfect, since I usually have a bag of that frozen berry blend in the freezer! 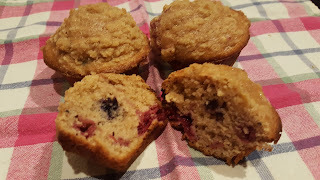 Another trick I like to use in muffins is substituting applesauce for some of the butter or oil. 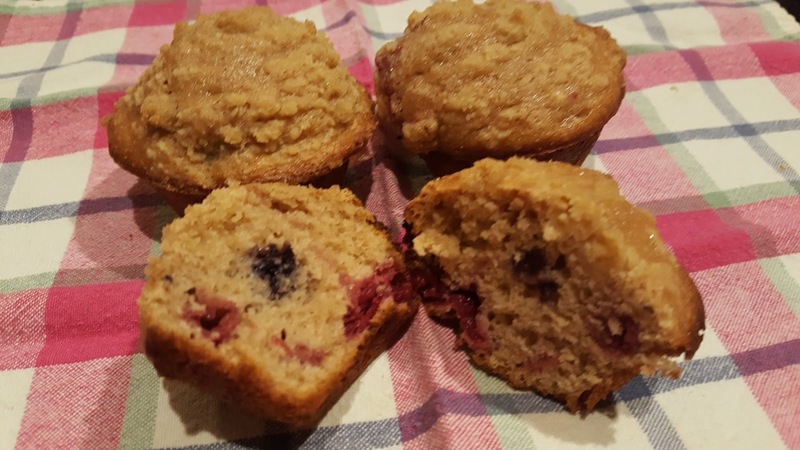 You can also use half whole wheat flour to make these healthier! 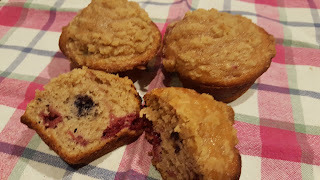 I also love it when recipes make a big "batch" - these kind of muffins freeze beautifully so you can use the ones you need now, and freeze the rest for another week! Thaw berries in the microwave for 1 minute or on the counter until they are soft, then mash with a fork to partly break up the pieces. In a large batter bowl, whisk together the eggs, milk, applesauce and oil. Add the sugar and stir until it is incorporated. Add the flour, cinnamon, baking powder and salt, and mix until all batter has been incorporated and is moist. Fold in the berries along with the juice of the berries until the berries are evenly distributed in the dough. In a separate small bowl, combine the flour, brown sugar and butter for the streusel. Cut in the butter with a pastry blender, fork or your fingers until it resembles coarse crumbs. Spoon muffin batter into 24 muffin cups sprayed with nonstick spray or lined with paper liners. Distribute the streusel evenly over the batter in each cup. Bake at 400 for 22-26 minutes or until a toothpick inserted in the middle comes out clean. Cool for 5 minutes in the pans, then remove the muffins to a wire rack to cool completely.